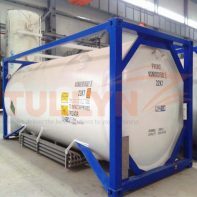 The cement tank container has an ISO 20ft tank container frame, usually has a bulk loading capacity of 22,500-litre. 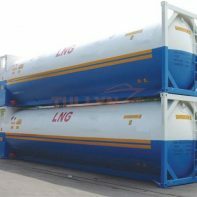 Our cement tank is separated for four purposes: tank containers for cement storage, short-sea, deep-sea shipping and rail transportation. 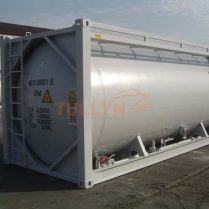 The tank containers are suitable for the transportation of bulk cement or coal powder by rail, road, and ship. 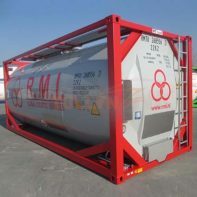 All materials used in the construction shall withstand extremes of temperature range from -19ºC to +80ºC / -2,2ºF to +176ºF without effect on the strength of the container. Insulation Shell Rockwool (50kg/m3) 50mm thick on aluminium foil. Ends Glasswool (16kg/m3) thickness to suit on aluminium foil. 110mm width stainless steel 304. 1” BSP inlet, 1” BSP outlet both with captive caps and cable. 4 bar working pressure, 6 bar test with warning decals and markings. A condensate drain is fitted. Manhole 500mm low profile, 8 point fixing with Super Tanktyt Lid seal. 2½” BSP Supermaxi Highflow relive, without flameproof gauze. Pressure only set at +4.4 bar (63.8psi). The assembly is situated off centre on a tangential tank pad. assembly DN 40 ball valve terminating with 1½” BSP connection and cap. Top Discharge DN80 stainless steel 316 tank pad with a blind flange. 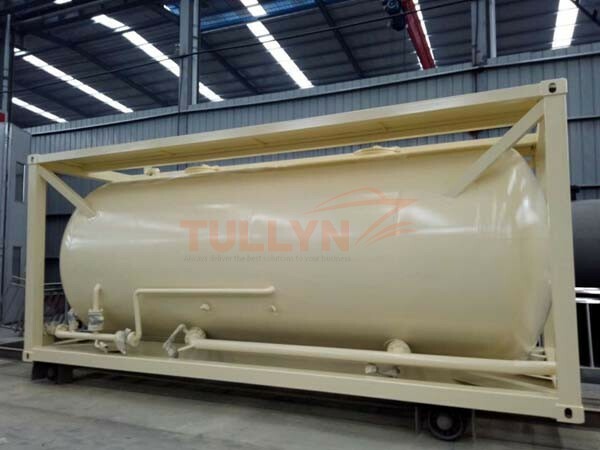 The assembly is fitted on centre on a horizontal tank pad. valve terminating with a 3” BSP spigot with 3” BSP blind cap and chain. scale -40°C to +160°C / -40°F to 320°F. The thermometer is fitted with a protection bar. holder A clear plastic document holder ø110mm is fitted to the rear right hand side beam. A drain hole is provided at the lowest point. Calibration A calibration plate marked in cm/litres is fitted on the spillbox side wall. No calibrated stainless steel grade dipstick and bracket fitted.